Most of you already know we just came back from our Walt Disney World trip. 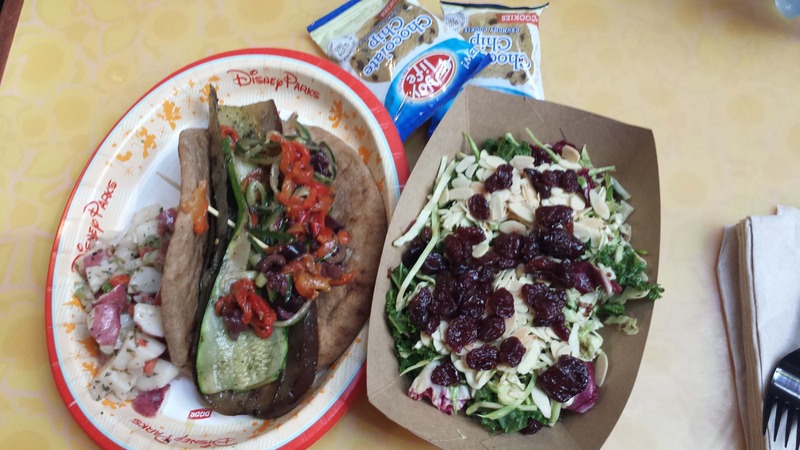 Are you wondering what it is like to be Vegan in Disney World? 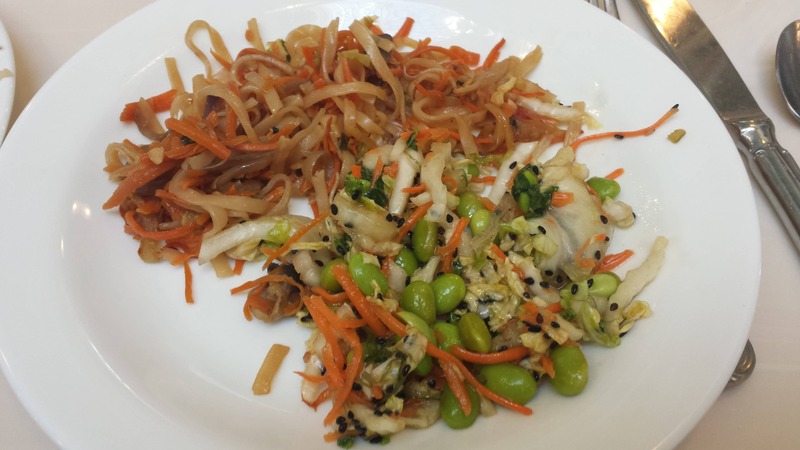 I am about to share with you my meals + some other helpful tips! 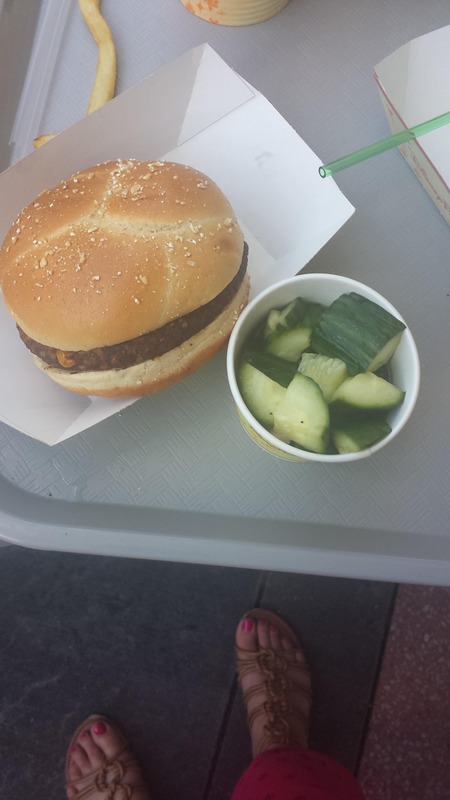 Being vegan in Disney World can be easy if you plan ahead. This post is kinda long, but there is a lot of good info about Disney, so I recommend reading it all. Planning ahead is key. If you plan on doing doing some table service meals, those reservations often need to be made in advance. Places book up fast, so you will need to plan your trip as early as possible. We went on a whim and only planned 2 months before going, so a lot of places were booked. When you make your table service reservations, be sure to tell them about your dietary restrictions and allergies. I would also call Disney dining 72 hours in advance to remind them of the restrictions. That way, when you go to eat, a chef will come out and talk to you about your options. Almost all hotel rooms have at least a fridge. 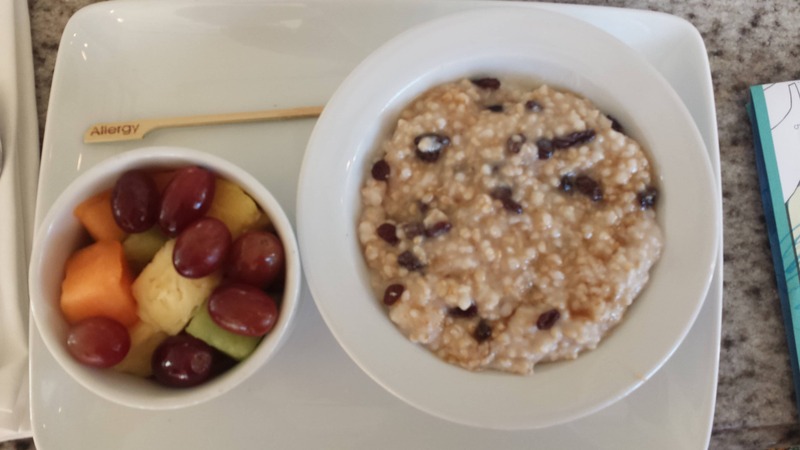 We planned to do several breakfasts in the room, so I ordered groceries from Garden Grocer. They will deliver the groceries to your hotel. I recommend placing your order about 72 hours in advance. Ours was ready and waiting for us when we checked into our hotel. Most of the things I ordered from Garden Grocer was fresh fruit and vegetables, cereal, almond milk, water and crackers. I also packed lots of snacky type things in my suitcase like larabars, nuts and dried fruits. These came in very handy when we wanted a quick snack at the park. I also highly recommend getting a hydroflask if you don’t already have one. They are awesome and will keep your water cold for a long time. There are plenty of places throughout the park where you can refill your water bottles. So we each got that every single day. The quick meal and the table service meal always included a non-alcoholic drink and a dessert. In all honesty, the dining plan was not worth it to us. I will not get it again next time for a few reasons. There were hardly any vegan desserts at the quick meals. It was usually a pack of Enjoy Life Cookies. Also, the plan included drinks, but we mostly drank water. With the Disney dining plan, you are only able to select certain items on the menus at the table service meals. The plan also does not include the tips. I think next time we will save money by opting out of the dining plan. These meals often need to be made way in advance. We booked one table service meal each day. The chef’s were VERY accommodating. As soon as you sit down, the chef will go over the menu with you and tell you the things he can make vegan. Same thing for gluten free or allergies. Disney takes allergies VERY seriously. I enjoyed every single one of my table service meals and I was never made to feel like I was being difficult. Here are the meals I ate. I LOVED The Wave! A lot of their ingredients were sustainable and local. They even had organic beer! 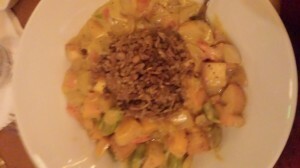 The chef made up this yummy butternut squash curry with lentils for me. The lighting was dark in there so my picture is kind of blah, but I promise you it was delicious! I also was served Tofutti ice cream for dessert. Our next table service meal was breakfast at The Grand Floridian Cafe. Again the chef came out to talk to us. They had a non dairy milk to offer use with coffee and he said that the steel cut oats were vegan. So that is what I ordered. 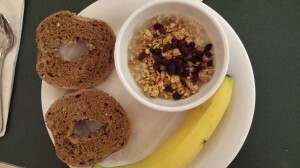 Very good, but I still missed my overnight oats. I also got a side of fresh fruit. This was probably the most disappointing breakfast. It was a buffet character meal. My girls love Sofia the 1st and Doc Mcstuffins, so that is why we went there. The chef came out and walked us through the buffet. There were hardly any options for vegans. 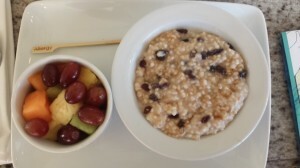 I pretty much had some steel cut oats with granola and raisins. I put a bagel on my plate too, but it was super salty, so I didn’t end up eating it. The next meal was at Tappan Edo, which is a Japanese restaurant where they cook the food at your table. The chef came out to talk to us. He told me they could prepare white rice for me, since the traditional rice they use was cooked in beef broth. The chef also cooked all the veggies first and served me, before he cooked all the meat for the other guests. 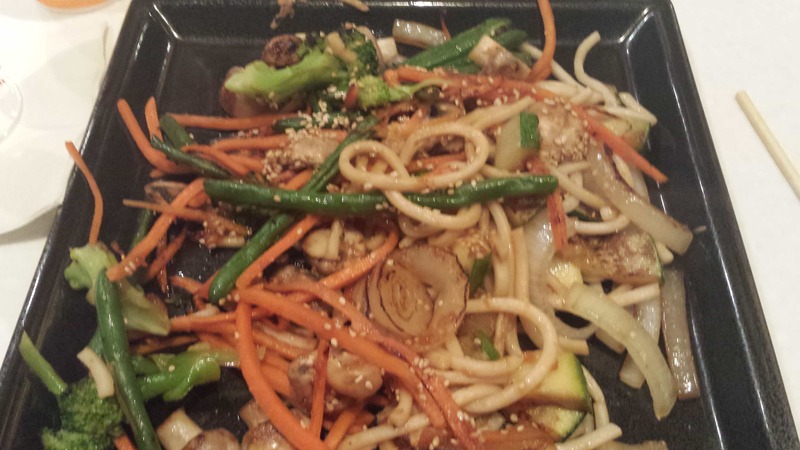 I basically got soba noodles and vegetables. They did not have any tofu. They also didn’t have a vegan dessert option, but I ordered some plum wine, which is like dessert anyway. The meal was good. I got to admit, I was a little skeptical when I saw The Crystal Palace was another buffet. This was a character meal with Winnie the Pooh and Friends. The kids LOVED seeing the characters. The chef came out and walked me through the buffet. There were a lot of vegan and also healthy options here. I got two different plates of food since I wanted to try it all. They had a rice noodle stir fry, cabbage and edamame salad, roasted sweet potatoes, sweet potato and black bean salad, quinoa salad and a cucumber salad. The chef also let me know that he had some sorbet as a vegan option for dessert, but we were pretty full from the meal, so we skipped it. The last table service meal we ate was at Yak & Yeti. I when I looked at the menu, I immediately thought I would order the vegetable lo mein with tofu. However, when the chef came out to talk with us, he told me that they use egg noodles and also anchovies in their stir fry sauce. He also told me they cooked their rice with beef broth. Good thing I asked! They had a miso salmon on the menu that he said he could make with tofu instead of salmon. He also said he could make me a side of brown rice and steamed veggies. The meal was very good and I thought I had snapped a photo, but for some reason my phone did not register it. 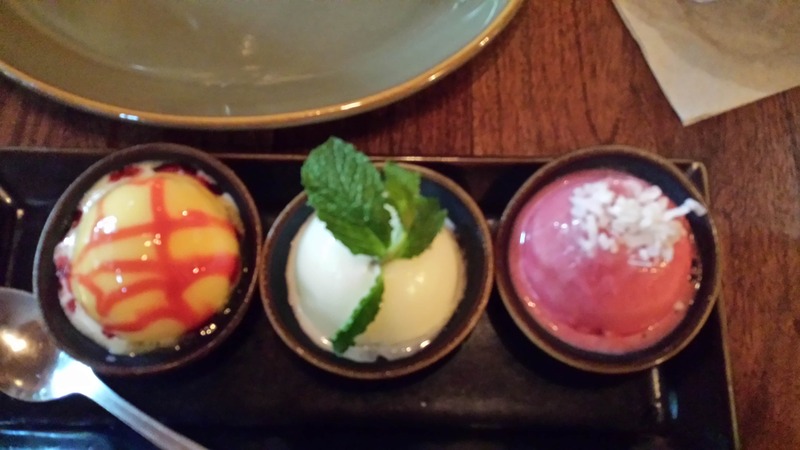 🙁 They also had a sorbet trio for dessert that was so good! The mango sorbet was my fave. I just might have to re-create that one! Quick meals were a little harder. Generally, the quick meal places were very busy and crowded. The food was not as healthy, but at least they could make things vegan. We ate here on the first day. 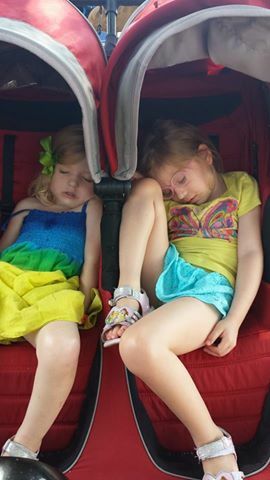 We had a long morning of traveling and were starving by the time we got to the park! We chose Cosmic Cafe because it was the closest to us at the time. They did have a veggie burger option. That is what I got. It was not very good in my opinion. But I was hungry so I ate it anyway. I skipped the fries and got some cucumber salad with it. There was no dessert option. If you get a chance, definitely book a lunch or dinner at Be Our Guest in Fantasyland. It’s in the Beast’s castle. The reservations book up fast. We kept trying everyday and one finally opened up for us. We ate lunch there. You pre-order when you book the lunch. They had a quinoa dish with a beet salad as a vegan option. OMG it was so yummy! Again the lighting was dark, but the food was delicious. There really wasn’t a vegan dessert option for this meal though. 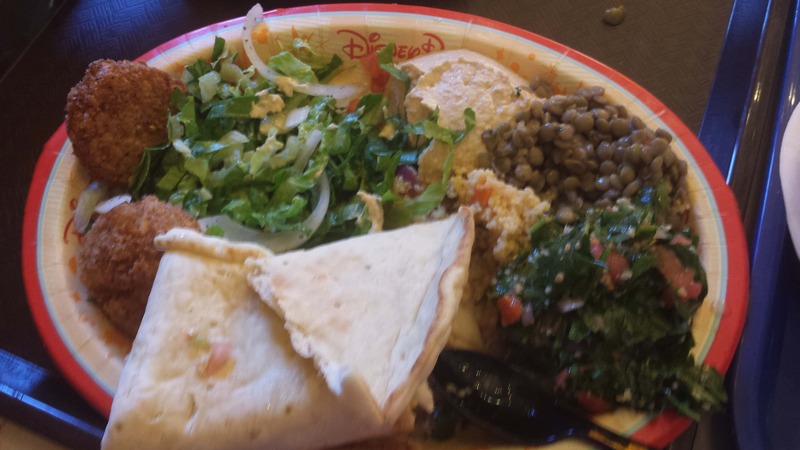 The next quick meal we ate was in Epcot at Tangierine Cafe in Morocco. Since my husband is Turkish, we eat a lot of Middle Eastern food. So this place was right up our alley. 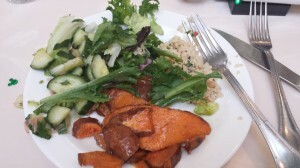 I got the veggie plate that came with falafel, hummus, lentil salad, tabbouleh, quinoa salad and a green salad. I skipped the falafel since I was told they fry it in the same pot as the chicken. 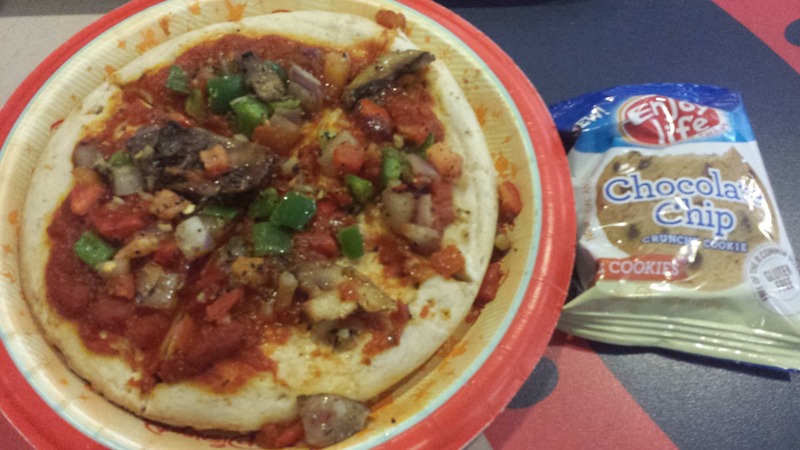 But everything else was delish and the pita bread was freshly made. The following day, we were in Epcot again and ate at Sunshine Seasons. It is located in the Living with the Land building. A lot of the produce used there was grown right on property. I had a really yummy quinoa power salad. My husband got some roasted vegetables with flat bread. He had to skip the hummus since he was told there was cheese in it. I though his flat bread was stale tasting, but my salad was delicious! They also had Enjoy Life cookies as an allergy option for dessert. The last day were were at Disney, we went to Hollywood studios and ate at Pizza Planet. It was not very healthy, but at least they were able to make pizzas with vegan cheese. The pizzas are all personal size. Both my husband and I got the veggie pizzas with no cheese, and my girls got the cheese pizza made with dairy free cheese. It took a lot longer to wait for our food since they had to make it fresh in the back. They also had Enjoy Life cookies as the dessert option. There are a lot of unhealthy snacks in the parks. However, if you look around, you can find things like hummus, fresh fruit and veggies at some snack booths. All the popcorn and pretzels served in the park are vegan. The ice cream parlor on Main Street also offers tofutti and rice dream ice creams. We mostly used the snack points for waters and hummus. If you happen to be at the Food and Wine Festival at Epcot, all the booths set up for that count as snacks. If you want to do a wine pairing, you will need to pay, but the food items are counted as snacks on the Disney Dining Plan. We visited the Terra booth that had all vegan items and even some vegan wine! We got the crabless crab cake and it was fab. So were the blood orange and chocolate cupcakes. I am going to try and re-create the flavors of the vegan crab cake. I am guessing it was potato based. If you have kids under the age of 6, I highly recommend renting a stroller. We initially thought we would bring our little umbrella stroller for my 3 year old, and let the 5 year old walk. At the last minute, I decided to rent a double stroller for both kids. This was one of the best decisions I ever made. There is A LOT of walking to do and if you want your kids to last all day without melt downs, the stroller is a must. Plus they can pass out in it if they get tired and mom and dad can enjoy a cocktail. 🙂 🙂 I rented mine from Kingdom Strollers and it was ready at bell service at the hotel when I checked in. There are tons of spots in the parks to park the strollers when you go on the rides. If you are a chase card holder, they have an awesome little perk we just happened to hear about from another guest. In Epcot, in America, if you go past the fountain towards that back, you will see a sign for the Chase Lounge. It’s on the second floor. It is a great way to cool off from the heat. They have a charging station for your phones, an air conditioned room with lots of couches and an X box for the kids to play. They also sell beer and wine. It was nice to take a break from the heat and charge our phones. Speaking of phones, make sure you pack and extra cell phone battery because they don’t last long at Disney. Please note the Chase Lounge is only open during the Food and Wine Festival at Epcot. Another thing I highly recommend is the memory maker. Basically, there are Disney photographers at all the parks. They will take pictures for you and it all gets linked to your magic band. This is a great idea. Not only are the photographers at some great spots at the park, you will get lots of pictures with your whole family. You don’t have to worry about lugging around a heavy and expensive camera. There are also Disney photographers at all the character meet and greets. We got 230 pictures on our memory maker. They also include a few Disney stock photos too. We got some awesome ones at the Halloween party. Book your fast passes as soon as you are able to. For resort guests it’s 60 days out and for non resort guests it’s 30 days out. If you are like us and didn’t score the Elsa and Anna fast pass, don’t worry! You can still see them without waiting too long. We made sure to get to the park long before it opened so we were at the front when they cut the ropes. We headed straight towards Princess Fairytale Hall and were there with only about a 20 minute wait to see them. Normally the wait is 120+ minutes! I highly recommend getting the My Disney Experience phone app as well as the Wait Times app. Study it before you go so you have an idea which rides have the longest wait times. It was a HUGE help for us when planning the day. 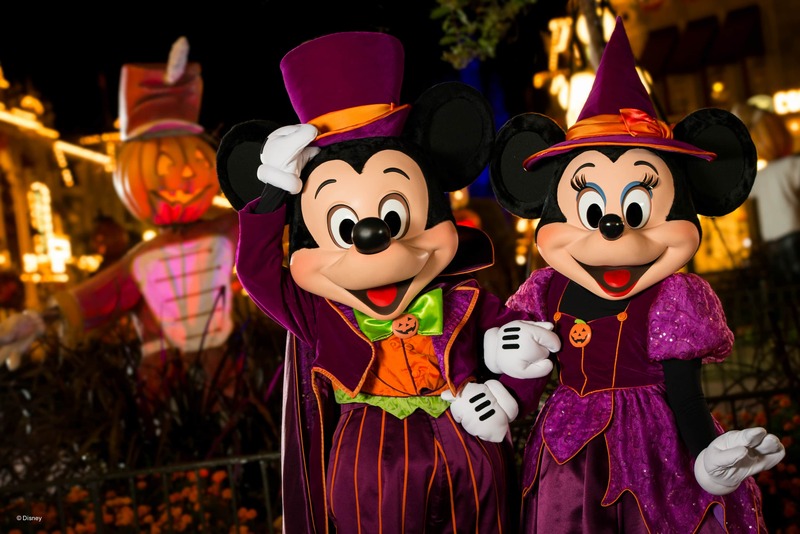 If you need more info and insider tips on Disney, check out this Facebook group. 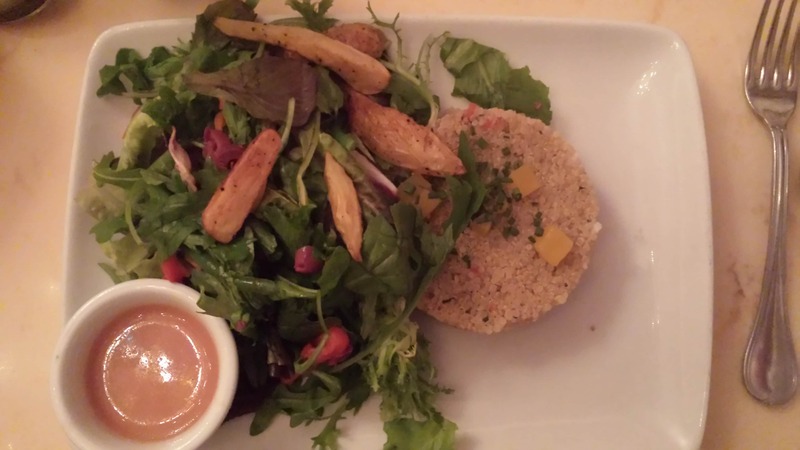 If you need more info on vegan dining at Disney, check out this Facebook group. I hope this post helps you with your Disney World Vacation. All in all we had a fantastic time and plan to go again when the girls are around 10 and 11. It looks like a great trip Melissa. On my past trip, I wasn't eating dairy or soy. I found that you could contact Disney prior to arriving and they would email you restaurants and foods without those ingredients. As you mentioned, the same goes for gluten. That list made it easier to plan out my meals. 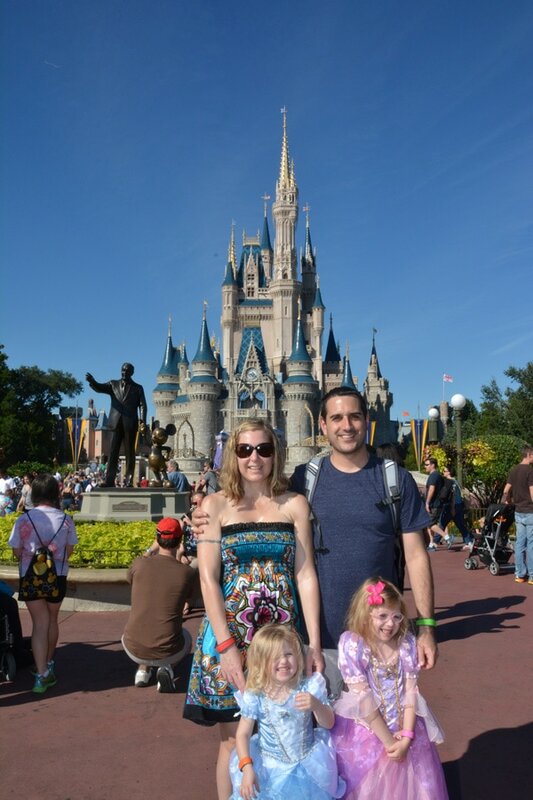 Our family enjoys going to Disney World and we've been several times over the years. We've done the dining plan once and found that it wasn't always the way we ate. We would rather snack and eat lighter meals throughout the day instead of one large meal. We don't drink sodas either an found that we didn't use that part of the dining plan. Now we opt to do a few table service restaurants for brunch or lunch, then share larger entrees at other places. It worked better for us. 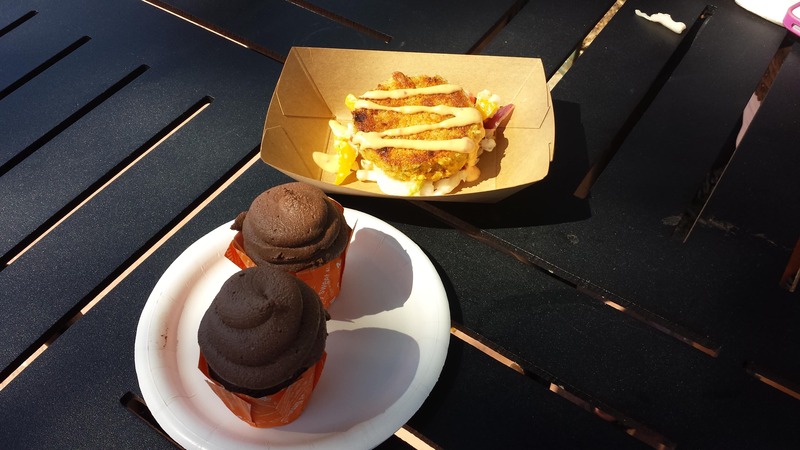 Disney is great about working with food preferences and allergies. It makes vacationing there so much easier. I agree they are very accommodating. Next time we go, I think we will stay somewhere with a full kitchen so we can cook some of our own meals. The dining plan wasn't for us for the same reason as you. Oh thanks for letting me know! I loved the food there. one thing I learned when researching our trip, is that you can send a box to the resort up to two weeks prior to arrival. Since I was traveling with a kid in diapers and we didn't do the dining plan, I sent diapers, wipes, breakfast foods, snacks, etc ... Sending the box was cheaper than paying for another suitcase. Plus, you have a box available to ship home souvenirs that won't fit in luggage. Hi Melissa. Wonderful trip. I have been following it all along your photos. I have been wondering how did you manage to eat at Disney which is I'm sure a junk food oasis. I can't stand all those big kids entertainment places because of lack of good food. I always bring a backpack full of food. But Disney is kinda far to bring food. You planned it and made seem effortless like a true Ukrainian LOL. On another note, I received your wonderful book yesterday and actually read it all. I will send a review to your publisher shortly. Great work and I am very happy for you! I love your honesty! Looks like you had a great trip! We have our trip planned over Thanksgiving and I just sent this over to my family as we have one who eats vegan, two who eat Paleo and another with an egg allergy. We should keep the DW chefs on their toes that week :) And thank you for the links to the stroller rental and grocery delivery. I just scheduled both of them for our trip! You are so welcome Christine! Have a magical time! Thank you for a wonderful, informative, super helpful post! You're welcome Diana! I am so glad it helped you! You are going to have a great time Lauren!